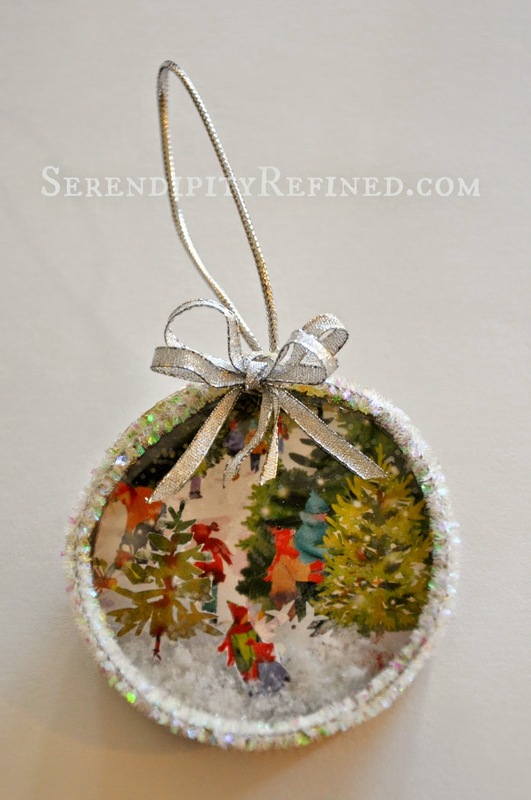 Today's ornament can be made from things that you probably already have on hand: a mason canning jar lid ring and an old Christmas card. Okay, there are a couple of other items but the majority of this project is those two things. I hoard old Christmas cards am a vintage Christmas card enthusiast. I've been saving them for years. It's gotten so bad that I've even asked my mom and dad to save them for me. I always planned to do a project with them but somehow never did and my small pile of Christmas cards now fills about half of a cardboard box. Normally, this wouldn't be an issue since the box has been safely tucked away in the attic. However, now that we're emptying the attic to get ready for the addition, my "secret" is out and I'm finally using part of my stash! 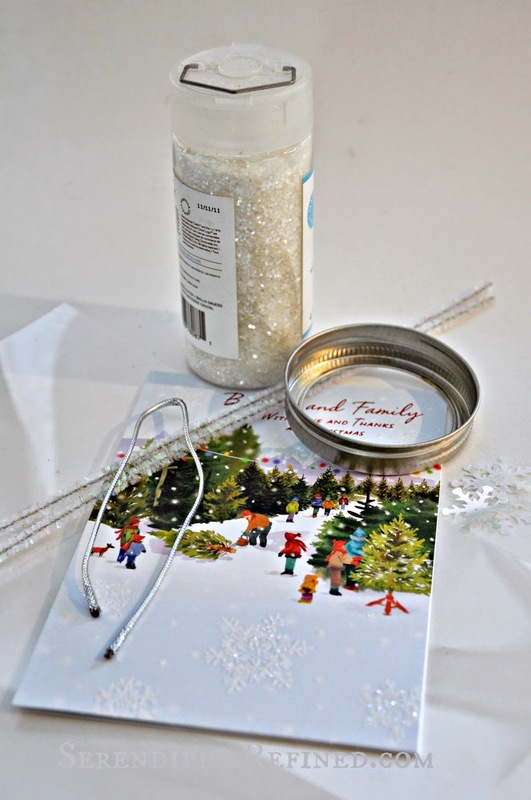 Place the ring on the section of card that you want to use for the background of your ornament with the wide part on the card. Using pencil, draw a circle around the outside of the ring. Do the same on the Transparency film (using Sharpie to draw the circle). Cut out the portion of the card cutting just inside of the line. Cut out the transparency film on the line. Turn the ring over so that the wide part is facing up. Place the cut section of card inside of the ring. Adjust to fit, hot glue in place. 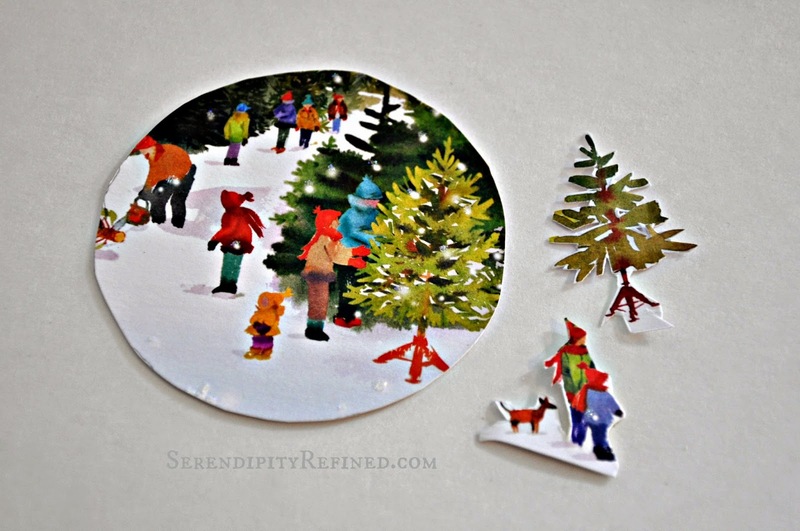 Using an X-Acto knife and/or sharp pointed craft scissors, cut out other sections of the card that will be placed in front of the background. 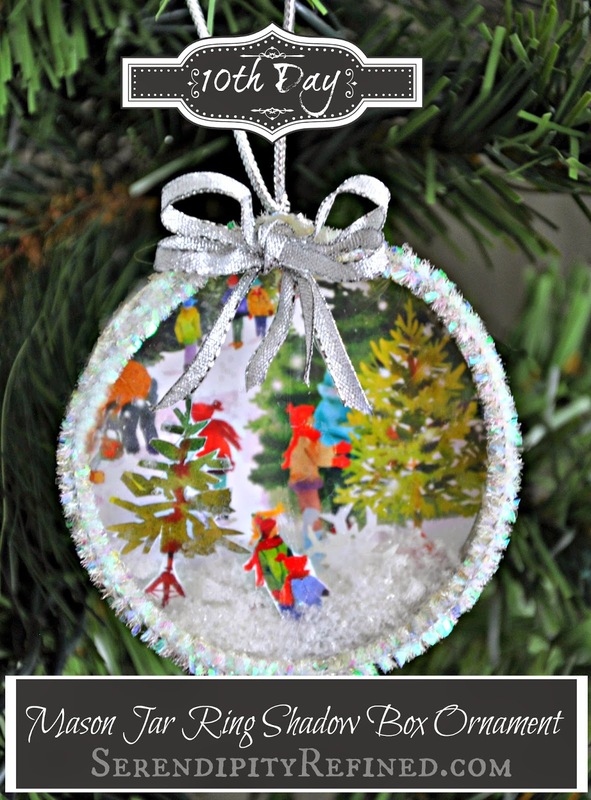 In my ornament, I cut a tree and children with a dog. Hot glue the additional items to the bottom of the ring in front of the background to create a 3-dimensional effect. 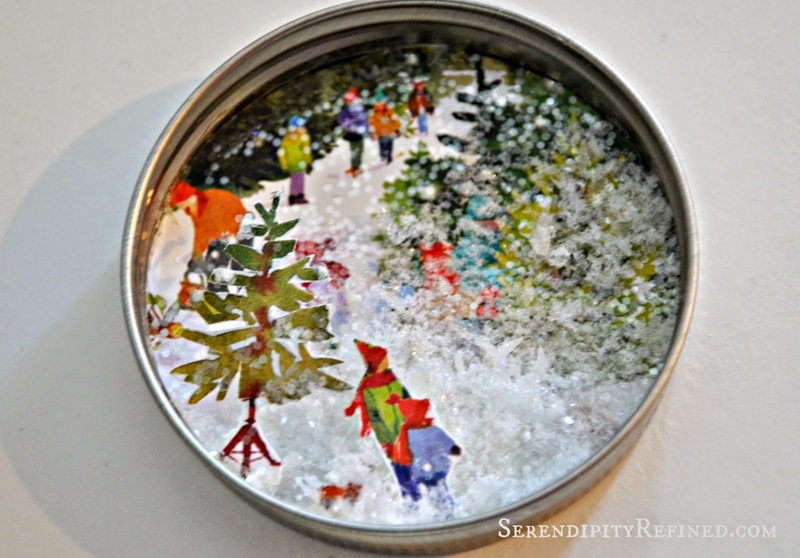 Add a few sprinkles of glitter, some snowflake sequins and a little faux "snow". Glue the transparency film to the top edge of the canning ring. Cover the edge by hot gluing a pipe cleaner around the edge. Hot glue a loop for hanging. Here's what my friends are making today. If you'd like to see how they made them, click the links below the photo to go to the tutorials. 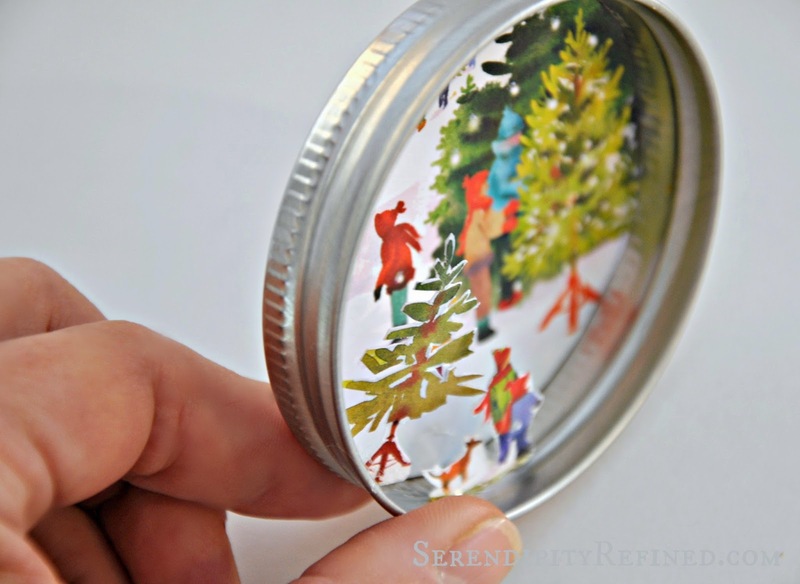 So if someone has discovered your secret stash of old Christmas cards (or even if they haven't), make a couple of these mason jar ring Christmas card shadowboxes to hang on your tree or to gift to friends! 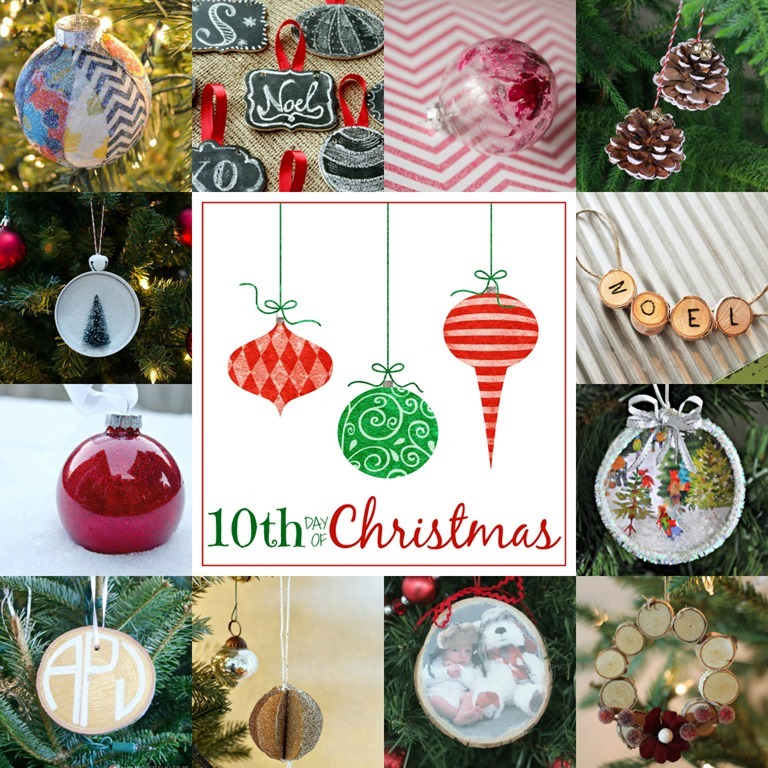 Stop by tomorrow for an ornament made from a wood clothes pin!